The evidence based on initial surveys is that brood year 2017 salmon (born last summer and fall) fry-smolt production was extremely poor. 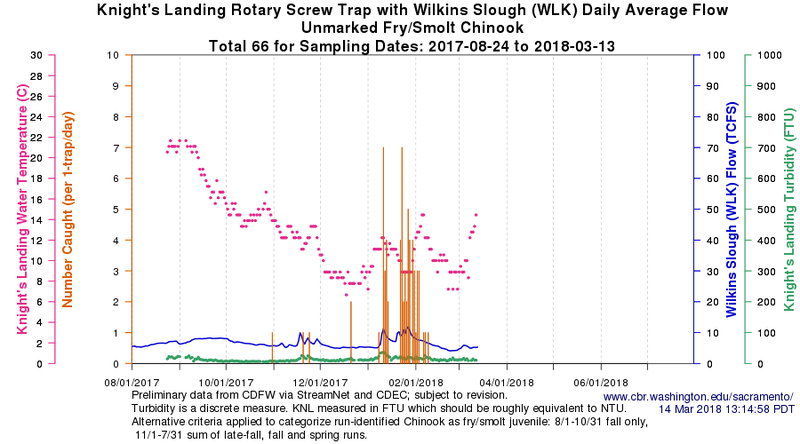 First, lower Sacramento River screw trap catches are low in early 2018 compared to 2017 (Figures 1 and 2). Winter screw trap catch-per-trap-day (and Sacramento trawl catch not shown) in the lower Sacramento River in 2018 are only 2% of 2017. Note flows and turbidities were very low in 2018 compared to 2017. I warned that these conditions with warmer water would lead to slower migration rates, starvation, and high predation by stripers. 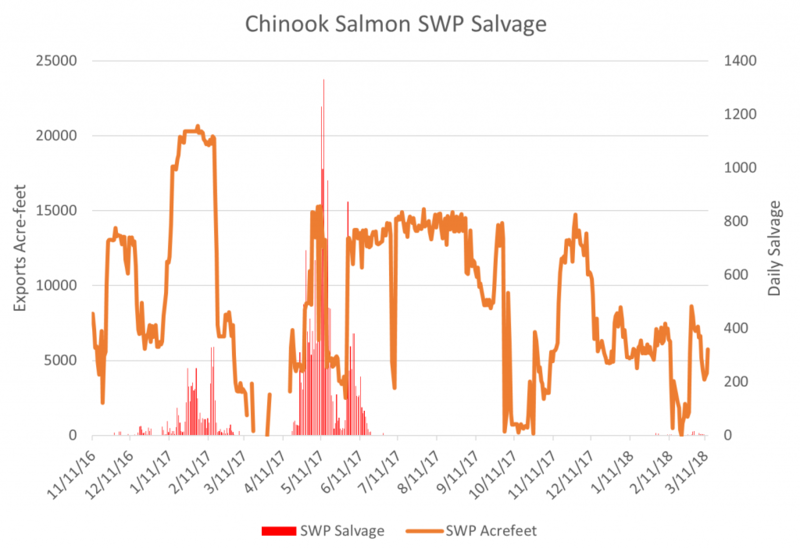 Second, salmon salvage at the south Delta pumping plants has been extremely low in 2018 (Figure 3) compared to 2017 (Figure 4). Salvage is a strong indicator of relative abundance. 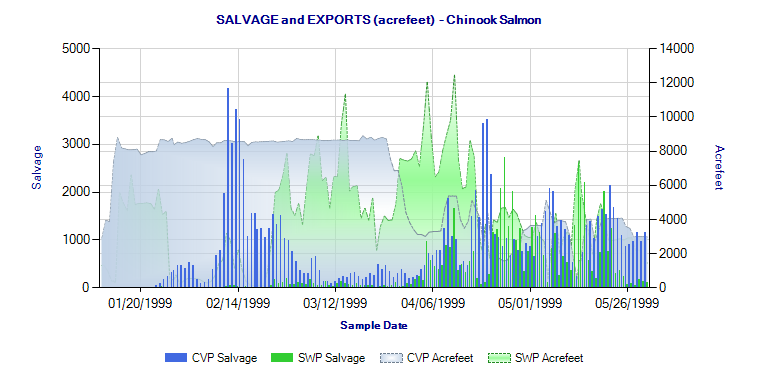 Third, compared to historical levels (Figure 5), salvage numbers in 2018 are two orders of magnitude lower than in 1999 when salmon runs were last strong. 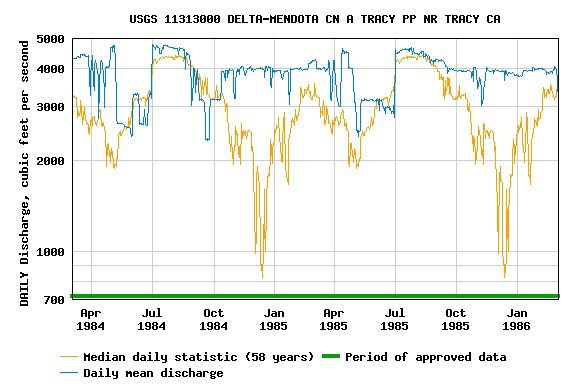 You can blame the problem on the 2012-2016 drought, poor ocean conditions, or poor river-Delta flow management as I do. Whatever the cause, strong measures are needed to recover the salmon populations. Without strong measures, future brood year production will be so low there will be few salmon and no salmon fishing. Figure 1. Knights Landing screw trap catch Aug 2017 to Mar 2018. Figure 2. 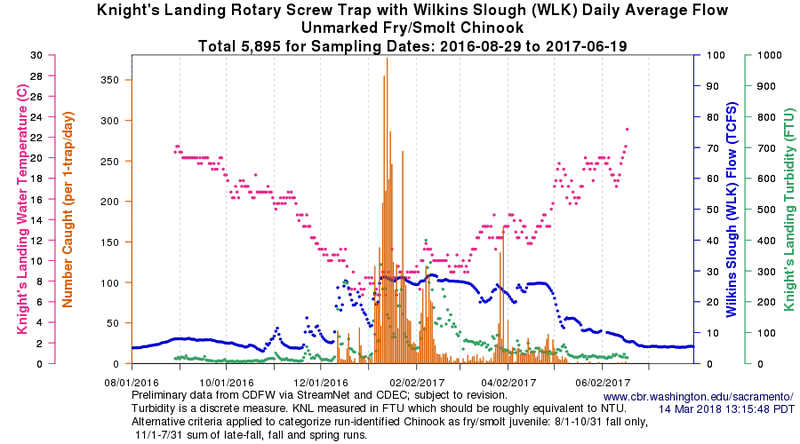 Knights Landing screw trap catch Aug 2016 to Aug 2017. Figure 3. 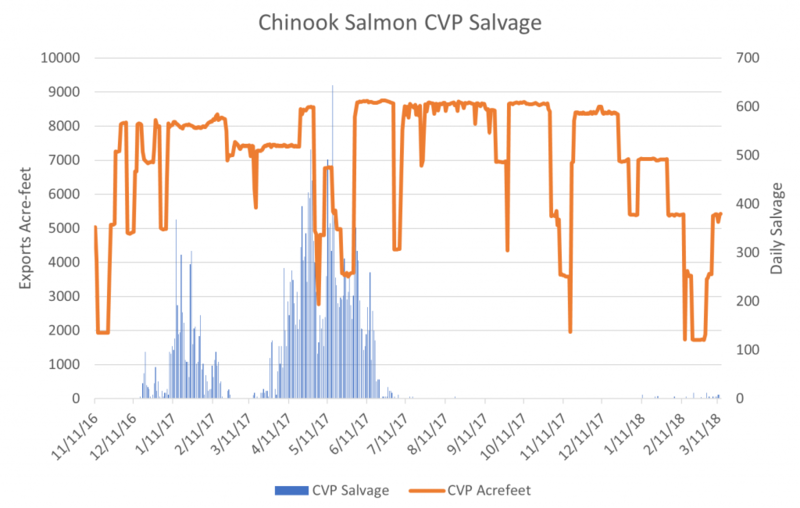 Chinook salmon salvage at CVP fish facilities in south Delta Nov 2016 to March 2018, along with export rate at Jones Plant. Note very small, nearly unperceivable numbers in winter 2018. Figure 4. 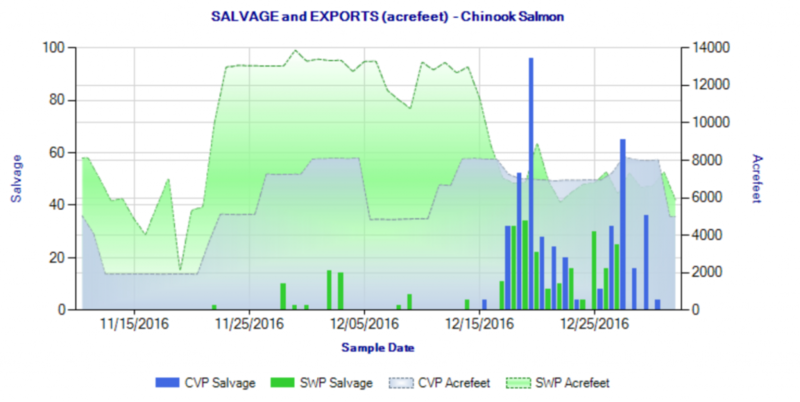 Chinook salmon salvage at SWP fish facilities in south Delta Nov 2016 to March 2018, along with export rate at Clifton Court. 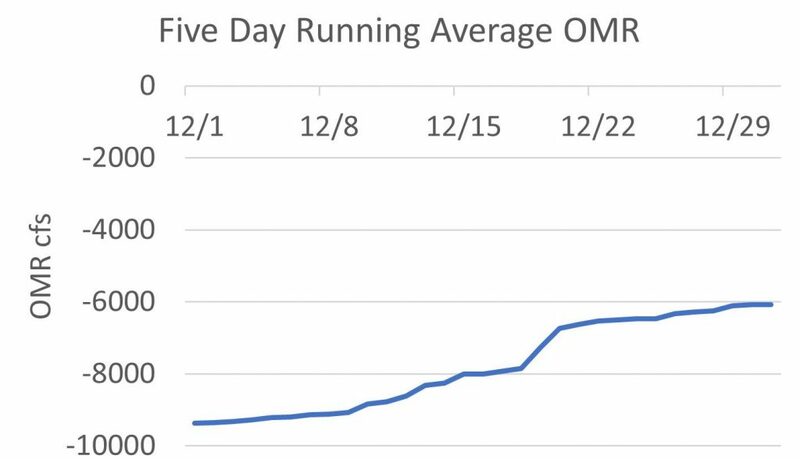 Note very small, nearly unperceivable numbers in winter 2018. Figure 5. 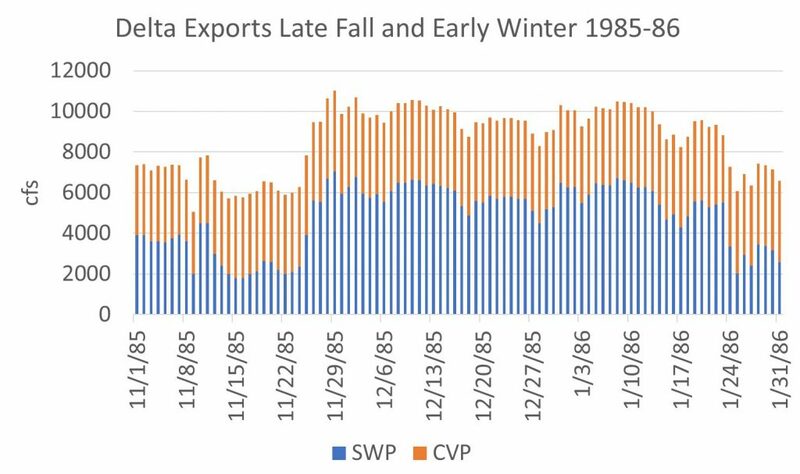 Chinook salmon salvage at CVP and SWP fish facilities in south Delta Jan 1999 to June 1999, along with export rate at south Delta pumping plants. One never hears much about Delta zooplankton, the food of most of the pelagic fish including smelt, and also the food of shad, young striped bass, and even young salmon. Zooplankton are the heart of the Delta foodweb. For decades, surveys by CDFW and others have noted that zooplankton suffer in droughts, as do fish that feed upon them. I (and many others) have always believed that zooplankton were one of the key factors in Delta pelagic fish declines. Many science papers suggest shifts in species composition over decades and declining densities after clam invasions as being key factors in long term trends in zooplankton. 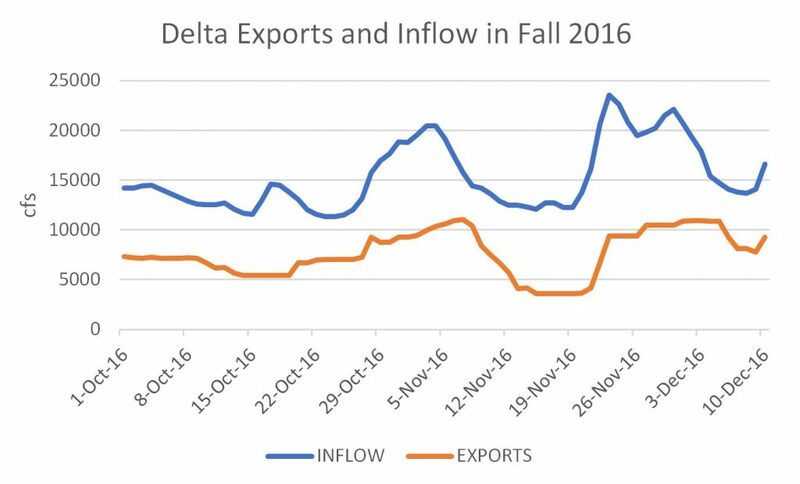 Rarely are freshwater inflow/outflow or Delta exports offered as key factors in zooplankton trends. 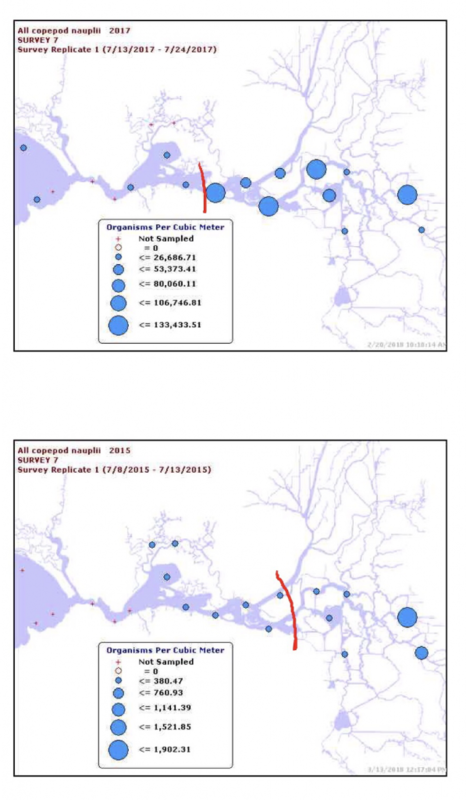 The multi-decade Bay-Delta zooplankton survey database is large and complex, making analyses difficult and time-consuming. There are no indices to follow abundance patterns as there are for fish. In this post, I provide some insights using a few specific comparisons of zooplankton densities between 2015, a drought year, and 2017, a wet year. I focus on spring and early summer, when zooplankton are perhaps at their greatest importance as fish food and when the difference between year-types is usually greatest. Some example comparisons are presented in charts below. Figure 1 depicts the difference in May between 2015, a critically dry year, and 2017, a wet year, for Cladocera (commonly referred to as water fleas), a predominantly freshwater zooplankton and important pelagic fish prey. Figure 2 depicts differences between June 2015 and 2017 densities of Pseudodiaptomus, a key young smelt food. Figure 3 depicts differences for total copepod nauplii in July. In each figure, the location of the low salinity zone is referenced by the X2 factor. My interpretation of all this is that zooplankton abundance and thus pelagic fish production are controlled by (1) flows through the Delta, (2) the location of the low salinity zone, and (3) south Delta exports. A much greater proportion of these key zooplankton populations are highly vulnerable to south Delta exports in drier years with low flows. 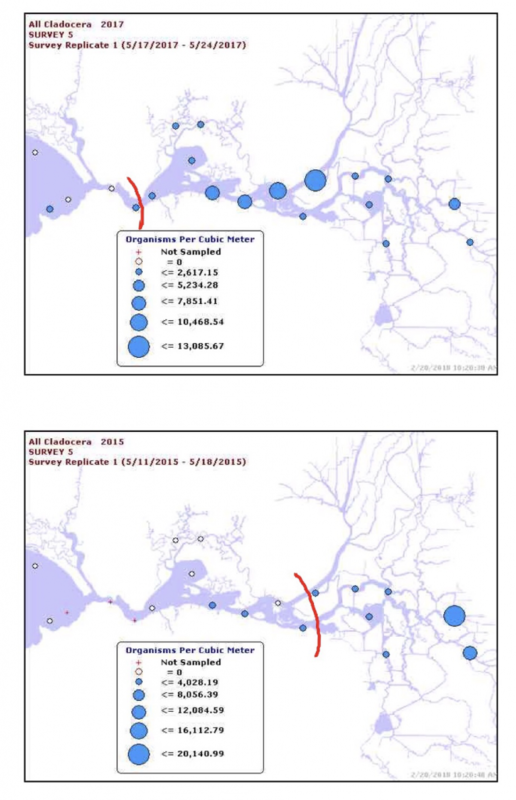 Furthermore, the proposed WaterFix would exacerbate these conditions and contribute further to the decline of Bay-Delta fish, primarily by reducing spring flows in the northern Delta channels and shifting the low salinity zone eastward. 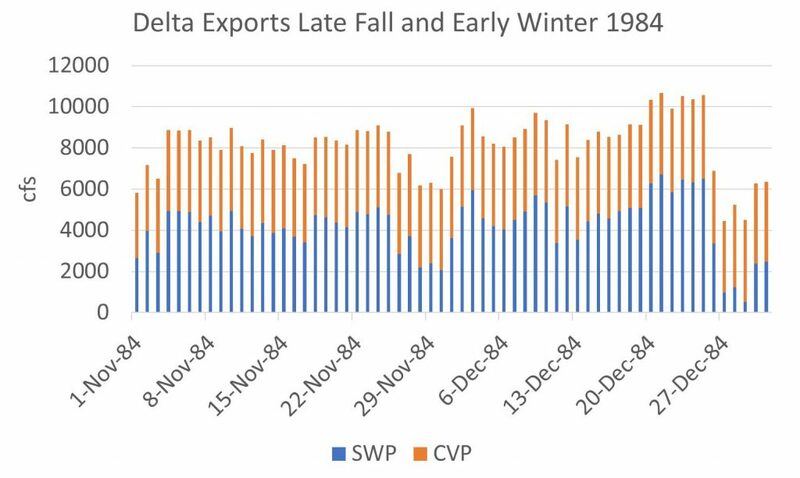 WaterFix would be less ofa factor in summer as south Delta exports are likely to predominate. Figure 1. Comparison of Cladoceran densities in May plankton surveys in 2015 and 2017, critical dry year and wet years, respectively. Red line denotes X2 (~3800 EC) in center of low salinity zone. Note that cladocera distributed further downstream in wetter 2017. Figure 2. Comparison of Pseudodiaptomus copepodid densities in June plankton surveys in 2015 and 2017, critical dry year and wet years, respectively. Red line denotes X2 (~3800 EC) in center of low salinity zone. Note higher densities and distribution further downstream in wetter 2017. Figure 3. Comparison of copepod nauplii densities in July plankton surveys in 2015 and 2017, critical dry year and wet years, respectively. Red line denotes X2 (~3800 EC) in center of low salinity zone. Note higher densities and distribution further downstream in wetter 2017. Figure 1. Lower American River floodplain referenced in recent science paper as non-natal rearing habitat of endangered winter-run Chinook salmon. Note the many borrow pits from Paradise Beach downstream to Discovery Park, remnants of a historical levee-building era. Conundrum: A confusing and difficult problem. The consulting firm FishBio reported in a February 12, 2018 blog post: “Just when you think you’ve got a species figured out, sometimes they show up where they’re “not supposed to be” and make you reconsider. 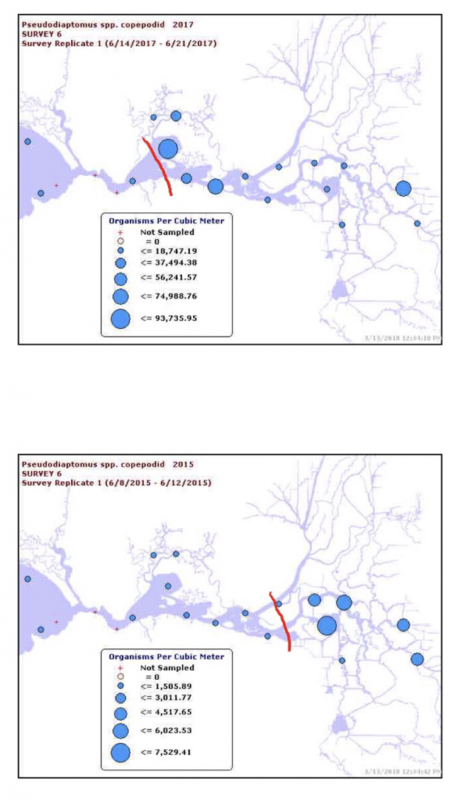 This recently happened in the fish world, when adult winter-run Chinook salmon, an endangered fish previously thought to only inhabit the mainstem Sacramento River downstream of Keswick Dam, were found to have actually reared in multiple Sacramento River tributaries as juveniles.” The study referenced by FishBio found that roughly half of the returning adult winter-run had reared as juveniles for a several weeks or more in habitats other than the mainstem Sacramento River. It has long been known that winter-run had used these habitats1, but the proportion of the population that had done so was not known. The recent study has helped answer that question. Such a life-history pattern is obviously important, as proven by this study. “These newly identified areas, called “non-natal habitats” because they differ from where the fish was born, can be divided into four distinct groups, including the Mount Lassen tributaries (Mill, Deer, and Battle creeks), the Sacramento-San Joaquin Delta and Feather River, the American River, and a final group rearing in an uncertain location that is not in the Sacramento River.” Again, these are not “newly” identified. Non-natal refers to rearing in adjacent river systems where fish were not born. 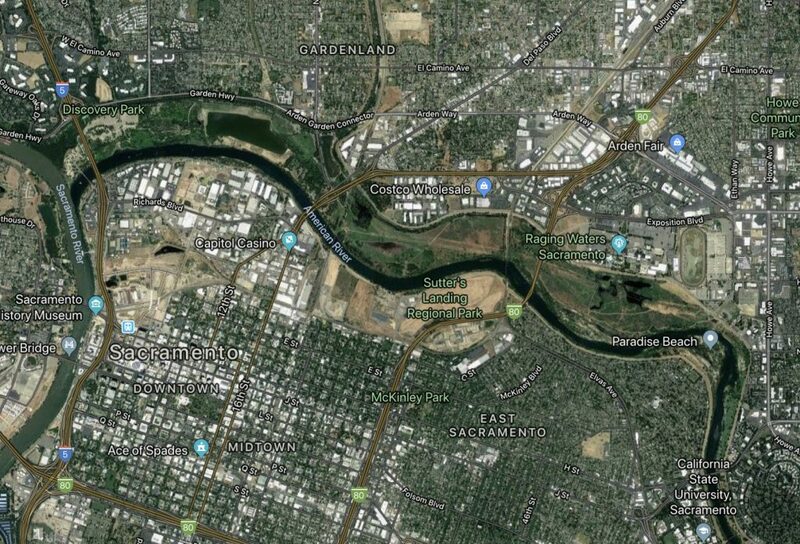 These habitats are part of the lower Sacramento River floodplain and other accessible habitat of winter-run. “So even though we might think winter-run are “not supposed to be” using these tributaries, the fish are actually spreading the risk of extinction across multiple habitats to safeguard their future.” These are the natural floodplain and tributary rearing habitats of winter-run. The problem is that there is not enough of these habitats left, and those that are left are often too ephemeral or are in poor condition. In many cases, the young salmon are gain access to floodplains but are later blocked from exiting, only to eventually die and not contribute to the population. Juveniles that enter the lower reaches of tributaries of the Sacramento River are sometimes cut off by seasonal dams or stranded in fields by unscreened irrigation diversions. Often, non-natal habitats (e.g., dredger ponds and borrow pits) are also winter refuges and permanent habitat for predatory warm water fish. Yes, these non-natal rearing habitats should be recognized, protected, restored, fixed, enhanced, and created where possible to help save the winter-run salmon population. In the meantime, such habitats will continue to support winter-run as they have in the past. There is no “conundrum”.